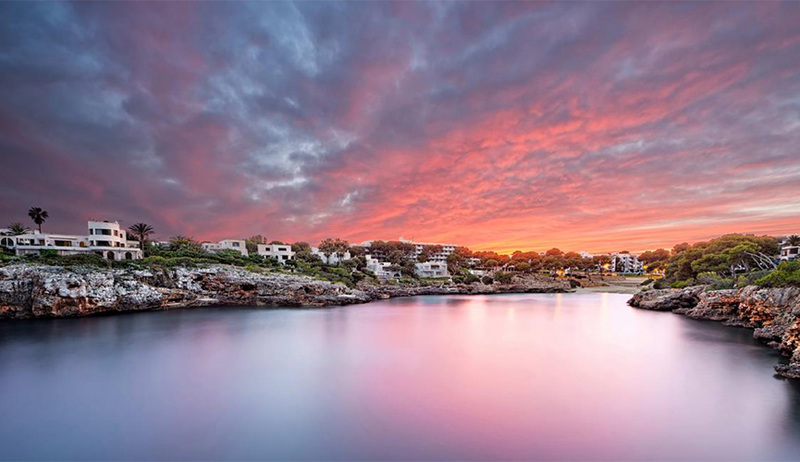 Cala d’Or is one of the nicest resorts that is situated on the east side of Mallorca. The people that visit this part of Mallorca have generally come to enjoy yachting, diving and have some cocktails at the beachfront bars. The beaches in this area are on the small side so in peak season they are very crowded. The resort is developed in the traditional Mediterranean style white buildings. The outskirts of this modern resort are mainly residential properties even though there are quiet holiday villas but nearer the coast there are numerous hotels and apartments. Cala d’Or was one of the first major resorts that were built in Mallorca and the theme they have used to develop this area is the same as Ibiza and the apartments as well as the Hotels have kept to this theme. 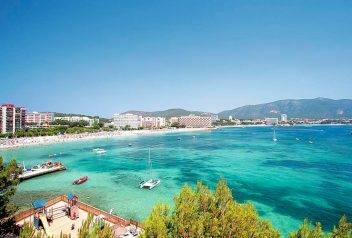 The beaches on the east coast of Mallorca are some of the best and the beaches in Cala d’Or are absolutely lovely. Set in alcoves and surrounded by pine forests with turquoise clear seas makes for spectacular scenery. It is also a long way from the Tramuntana mountains so enjoys the most sunshine and perfect for a day on the beach or yachting. The only problem with the beaches in Cala d’Or is that they are exceptionally tiny. There are 5 of them in all and the general size is about 40 meters wide and 100 meters long. You will generally find a place to sit or lie provided you do not want to be right at the water’s edge. if you would like to go to the larger beaches you will need to use a car or boat to visit S’Aramador and Mondrago beaches. They have beautiful white sand and the sea is unbelievably blue. Once there the promenade has some beach bars where you can get refreshments. There are numerous sea activities that you can enjoy in Cala d’Or and there are lots of companies that offer full day or half day boat trips. If you would like to explore the coastline you can charter a boat and you have the choice to have a skipper or not. This is the best way to see all the magnificent alcoves of the coastline because most of them are only accessible by sea. Snorkelling and diving is a popular past time on the east coast of Mallorca. Shopping is mainly targeted at the tourist market and there are fashion boutiques as well as souvenir shops. There are no markets and if you would like to visit a market while you on holiday you will need to travel to Santanyi or Felantix. Sporting activities include golf and tennis which most hotels will allow you to use the courts. The golf course is a 15-minute drive from the town centre. You can also hire bicycles and scooters and for the hiking enthusiasts, there are quite a few trails available in the mountains behind the coast. There is no shortage of hotel accommodation in Cala d’Or with most of the big Spanish hotel chains operating here. There are also apartments for rent and if you would like to stay in accommodation that has a bit more character you will need to visit the hotels situated in the hills. Just like the hotels, there is an abundance of restaurants with cafes lining the streets. If however, you would like to visit upmarket restaurants you need to visit the Marina and restaurants such as yacht club and Port Petit. The views from the Marina are also spectacular and well worth visiting. There a good selection of bars and clubs but it is important to note that out of season a lot of them are closed. 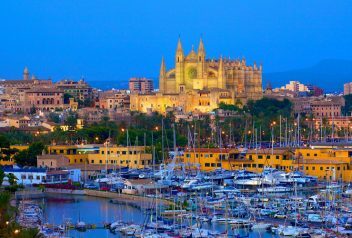 Palma De Mallorca is an absolutely stunning town that is rich in history that dates back as far back as the 13th Century. It has been inhabited by the Moors, Romans and Talayotic people. 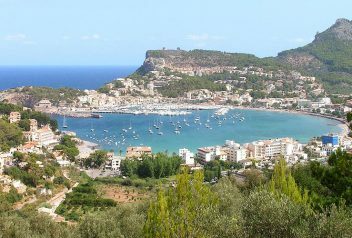 Soller is a beautiful historic town in Majorca where the mountains really do meet the sea. It is one of the oldest inhabited towns in the world with records going back to 5200 BC. Definitely a place to visit for history buffs. Deia is a picturesque little town with a rich heritage of history. 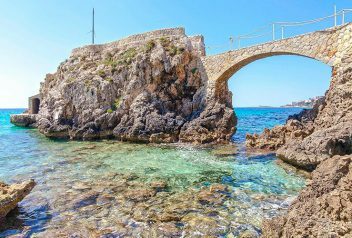 It is an extremely tranquil and beautiful place to visit for those that are looking to see some of the real Majorca and its people. 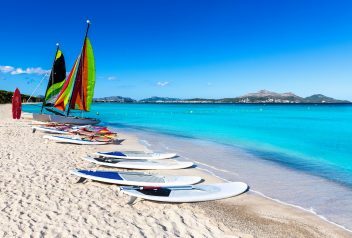 Cala Major has some of the best beaches in Majorca perfect for families looking to unwind while keeping the kids happy. It’s also very close to Palma so handy for trotting off on an excursion or activity for the day. 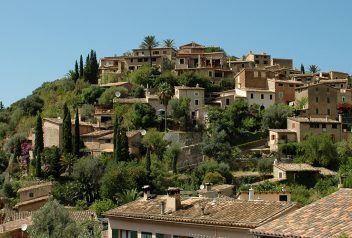 Muro is a small town in the North of Mallorca is a typical rural town that you will find in Mallorca. It serves as the administrative town for the famous beach resort Playa de Muro….